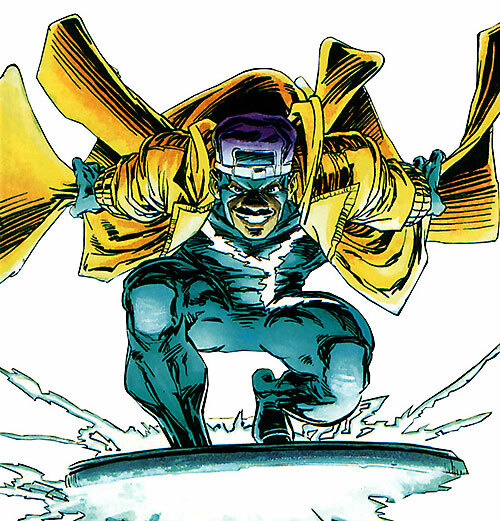 Static is a young super-hero who first appeared in 1993. 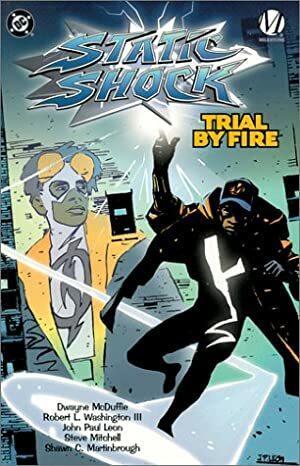 Created by Dwayne McDuffie, he was part of the Milestone universe, a new super-heroic setting where the frame of reference was 1990s persons of colour rather than 1940s White upper classes. Static also knew success as a cartoon character adaptation. 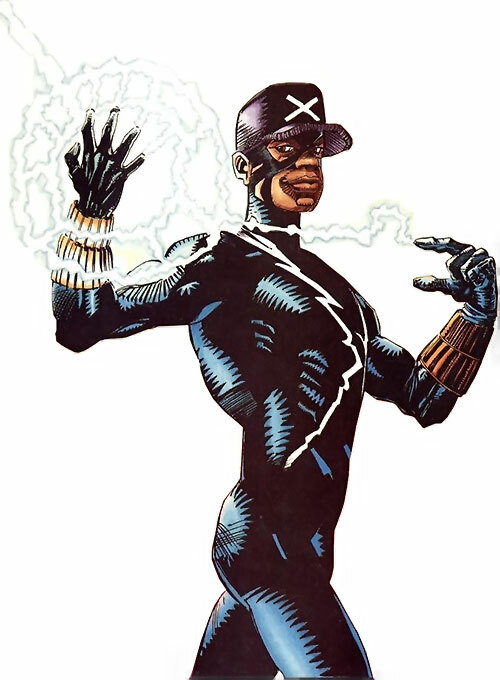 When the Milestone universe was eventually absorbed by the DC Universe, this greatly helped Static not to disappear, and become a DC character making actual appearances. However, this profile is solely about the Milestone version of Static. One thing at a time, eh ? Real Name: Virgil Ovid Hawkins. Known Relatives: Robert Hawkins (father), Jean Hawkins (mother), Sharon Hawkins (sister). Base Of Operations: Paris Island, Dakota City, United States of America. Height: 5’7” Weight: 140 lbs. Virgil was exposed to the “Quantum Juice” laden tear gas that was unleashed at the Big Bang. As a result, his body gained the ability to generate and release large amounts of electrostatic energy. He can use it for a variety of effects. He has full control of the amount of electricity he releases. For instance, he is capable of mentally restraining his output to a simple painful shock or a full charge blast that is capable of delivering enough voltage to kill a full grown man at a distance. He can also use his body as a transformer. In the past he as absorbed the electricity from a nearby power source and used the access energy to augment his own power. When Virgil’s is actively using his powers, anyone who makes direct contact with his body is in danger of being electrocuted. Virgil himself is immune to such dangers. Alter the charge on the atoms of both organic and inorganic matter. This causes them to become attracted to or repelled from opposite charged objects. Monitor and broadcast radio-wave transmissions. Manifest lines of intense electrostatic force around metallic objects, which causes them to be surrounded by a strong magnetic field that he can use to manipulate them. The magnetic fields he creates in this manner are highly potent. The strongest field he can create without utilizing an exterior power source can levitate an object the size of the average sedan. 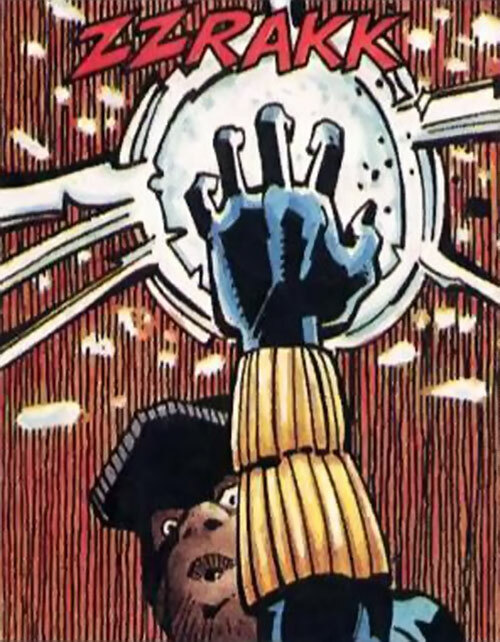 Static makes good use of this facet of his power. He often performs feats as simple as magnetically levitating convenient objects (like a trash can lid) while standing upon it to effectively gain the power of flight. He’s also prone to shaping ferrous objects during battles into cages, lassos or whatever is needed to hold his opponents prone. Through some unknown application of his abilities, Static can create a durable electrostatic field of force. The field can reflect metallic objects like bullets or pipe with ease. In some unknown manner it also can withstand intense impacts from other non-ferrous objects. Virgil is a gifted student who possesses a natural comprehension of the natural sciences. He is able to apply scientific theory and analysis to most problems that he encounters in the field. Thus, he can come up with a workable solution within a very short period of time. Virgil Hawkins was an average high school teen going to Dakota High the day before the “Big Bang”. His day consisted of him hanging out with his buddies Richie, Felix and Larry and getting into the normal amount of trouble that any other teenaged boy would get into. On that particular day, Virgil met the girl who would one day be the biggest influence in his life, Frieda Goren. She joined the group at Larry’s behest, and in moments they were all riveted by Virgil’s humour. Or at least that’s the way he told the story. When the group broke up to go to class, a particularly obnoxious young man made a blatant advance towards Frieda. Frieda balked at his advanced initially, but the young man (who went by the name Biz Money B) refused to take no for an answer. Virgil intervened with his “trademarked” humour and made Biz look foolish. Embarrassed, Biz let Frieda go. She promptly left for class but not before telling Virgil that she’d call him. Stunned, and clearly taken with the beautiful young girl, Virgil didn’t notice Biz’s growing anger. In seconds, the much larger Biz Money B exploded. He attacked Virgil with a flurry of blows and racially charged insults. Virgil, being both embarrassed and in pain, did the only thing he could. He sat there and cried softly to himself. He felt the awkward gaze of his peers as he sat there and took Biz’s abuse, until Larry returned. Larry, being even bigger than Biz, broke up the fight and forced Biz to leave Virgil alone. Larry then walked Virgil out of the school and out of the eyesight of his now murmuring schoolmates. The two sat outside the school for a few moments, when Larry finally decided to give Virgil some advice. He told Virgil that unless he took back his respect, the next four years of his life would be decidedly unpleasant at Dakota High. When Virgil didn’t answer him, he offered to sell him a gun. Virgil didn’t give Larry an answer. But when he went home that night, Frieda helped him make his decision. She surprised Virgil by calling him (he had no idea how she even knew his number) and consoling him over the events of the day. Unfortunately, in doing so, she insulted his “manhood” and embarrassed him further. Feeling that he was left with little choice, Virgil met Larry that night. He took him up on the offer for a gun. At the same time that Larry gave him the gun, he also told Virgil about the Big Bang. The Big Bang was shaping up to be largest turf war in Dakota City’s history. Over 500 gang bangers were expected to show up at “Ground Zero”, the intersection of all the gang’s territories on Paris Island. There they would settle their differences once and for all. Biz Money B was expected to be at the bang, and Larry reasoned that within all of the confusion, Virgil could settle their score easily. For the first time in Virgil’s short life, he set out for Paris Island looking for trouble. When Virgil arrived, the first blows of the conflict had been landed. Chaos erupted amongst the gang bangers. As people dropped left and right, Virgil stalked through the shadows of the battle ground. He eventually came upon Biz Money. Letting out a nervous breathe, Virgil took careful aim at the back of Biz Money’s head, steadied his arm and slowly squeezed the trigger. Before the gun could go off, he let his arm drop limply to his side. He wasn’t a killer, and he knew it. This simply wasn’t him. With shame in his heart, Virgil ran from the conflagration. He ended up at the docks, where he threw the pistol into the water. With that done, he turned about and prepared to go home when the authorities arrived. Before Virgil could react, a foul smelling tear gas filled the air, his lungs and those of the people that surrounded him. The chaos rapidly turned into confusion and then into a mind numbing panic. As Virgil swooned under the effects of the gas. He watched in horror as it literally melted the skin off of some of the teens that surrounded him. People, both cops and gangsters, were dying to his left and his right. At that moment, the confusion and gas became to much for him to handle. Virgil collapsed to the ground unconscious. He awoke a short time later. After shaking out the cobwebs, Virgil began the long trek home. To his horror, hundreds of bodies littered the ground about him. He picked his way carefully through the field of corpses when he noticed glowing humanoid shapes rising gracefully into the sky. Some had wings, some glowed like stars, some just flew. But in a second Virgil realized that the gas had changed them all. Such altered persons would soon be called “gang babies”. Virgil was standing quietly, processing the bizarre events of the Bang. However, he was set upon by a group of armoured men wanting to apprehend him. Assuming that they were the police, Virgil attempted to surrender. But as he raised his hands bolts of electricity erupted from them. The armor clad men retaliated in kind, but Virgil’s new found abilities proved to be too much for them. He escaped by soaring into the sky on a floating trash lid that was hovering nearby. The Birth of the Cool ! Virgil spent the next couple of weeks discovering the limits of his new found powers through a process of trial and error. Though he didn’t initially have any concrete plans of what he would do with them, he began working out religiously. He practiced with his abilities daily until he felt he could reliably use them without accidentally harming himself or anyone else. By that point in time, Icon had appeared upon the scene in Dakota City. Perhaps Icon’s appearance influenced young Virgil. Maybe it was the four colour heroes found in the comic books of his youth. Whatever the source of his inspiration, young Virgil Hawkins began to work feverishly to create his own costumed identity. It didn’t take the youth long. He soon he found himself soaring over the streets of Paris Island as the costumed hero Static. Virgil’s powers and charismatic personality quickly made him a celebrity on Paris Island. In a short period of time, he found himself easily foiling robberies, breaking up fights and generally keeping the peace. And while Static enjoyed a surge in popularity, so too did Virgil. His relationship with Frieda continued to grow, and the two seemed to be on the cusp of romance. It was at this point that the bang baby Hotstreak sent members of his new gang to abduct Frieda. Apparently, Hotstreak felt that Frieda was “worthy” of his attention. But Static appeared on the scene and made quick work of the bangers, leaving a big impression on Frieda. The next day (after gushing to Virgil about her rescue from Static), Frieda was abducted at gun point by other members of the same gang. Virgil ducked out of class, and after donning his costume went to confront Frieda’s captors. Virgil found Hotstreak in a local park and playground, and after throwing a few pointed barbs at one another, the two fought. Virgil had the super-speedster at his mercy, easily defeating his attacks with his powers until he inadvertantly uncovered Hotstreak’s face. Biz Money B stared balefully up at Virgil from under his hood, enraged and ready to fight. Virgil froze; looking into the face of his former bully was to great a shock. While Virgil was distracted, Biz used his speed and heat powers to break free and once again beat Virgil into the ground. Virgil felt a great sense of déjà vu, as he lay stunned and beaten on the ground with Biz Money lording it over him once more. Hotstreak and his gang eventually left a bruised and battered Virgil in the park, with new confidence in themselves. Hotstreak even left Frieda behind due to the fact that he lost interest in her during the fight. As the gang of boys left the scene, Frieda crawled over to Static. In her attempts to administer to his wounds she pulled back his mask. She could only stare in shock, as Virgil’s battered face looked sadly up at her. The two regrouped later that afternoon at Frieda’s house. Virgil told Frieda the circumstances of his empowerment. Frieda apologized to Virgil for her part in what happened, but Virgil wouldn’t allow her to take any blame. Instead, he steeled himself for what he felt he had to do next. He realized that Static had lost most of the street credentials he had earned over the last few weeks by allowing Hotstreak to defeat him. He needed to gain it back. Virgil left Frieda’s home and flew back and forth over Paris Island in search for Hotstreak. Coincidentally, he found him in the exact same park where they had faced each other before. But this time, Virgil was prepared. This time, Virgil beat Hotstreak in seconds and utterly embarassed him in front of his entire crew. With Hotstreak neutralized, Virgil returned to Frieda’s home an expressed how he truly felt for her. When Frieda awkwardly told Virgil that she felt they would be better off as friends, he accepted stoically but confidantly told her that they would reopen the discussion at a later date. The later date came a few weeks later, when Virgil stumbled upon Frieda making out with his friend Larry. Angry and hurt, and still reeling from an encounter with Holocaust Virgil stormed away from his friends. He refused to speak with them. Virgil eventually calmed down the next. He reconciled with Frieda and Larry, due to some unexpected help from Holocaust. Virgil had been tempted by his offer, especially while he was shaken by his discovery of Frieda’s secret relationship. But while on the “job” with Holocaust, he was unable to use his abilities to harm anyone that he perceived as innocent. In that moment he realized that there were things bigger than his own petty issues. From that point forward Virgil focused his full attention on crimes of all sizes. He ended up in conflict with numerous Bang-Babies including: Tarmack, Swarm, Commando X, Puff, Coil, Snakefingers, Joyride and others. Unfortunately, his focus on fighting crime created havoc in his personal life. His friends at school became somewhat disgruntled at his constant disappearances. He lost his job at a local burger mart. Of course, this put him at odds with his mother since his family needed the additional income to maintain its standard of living. To make matters worse, Virgil’s relationship with Daisy Watkins (a girl who had expressed her attraction to him when his relationship with Frieda became a non-issue) came to an abrupt end. 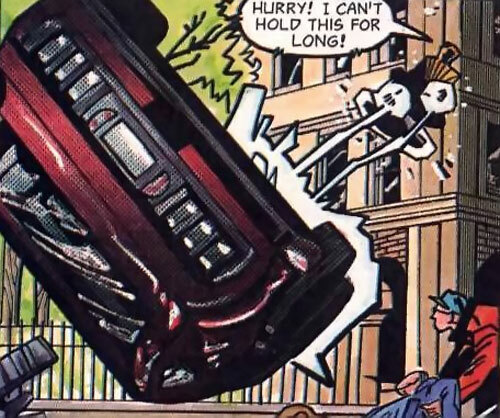 Virgil’s responsibilities as Static forced him to abandon her one time too many. It was during this time that Static was approached by members of the Shadow Cabinet. The Cabinet was a group of superhumans that had been operating in secret for years, but had recently fractured into two competing groups. Their leader Dharma had known and protected the secret of the tear gas that had empowered the Bang Babies. But the former members of the Cabinet (now calling themselves the Star Chamber) had decided to recreate the gas and create additional superhumans. Static, alongside of Icon, Hardware and other members of the Shadow Cabinet worked together to defeat the Star Chamber and ended up preventing a global catastrophe. Shortly thereafter, a young man name Fred Bensen discovered his ability to open dimensional rifts between two different planes of reality. His power grew up until the point where he accidentally merged the two realities together. Static joined forces with Icon, Hardware and the “Superman Family” of the DC Universe. Together they defeated Fred, who had taken on the name Rift. The toll of being a superhero eventually proved to be too much for young Virgil. He lost too many friends, including Larry who was shot while dealing drugs. There also was the apparent death of his one time ally and romantic interest Dusk. Virgil decided to abandon his superheroic identity and focus on being a regular teenager. His retirement lasted for several months… until the machinations of John Tower forced him back into action. Tower had kidnapped every Bang Baby he could find within Paris Island. He was using their blood to fuel his superhuman abilities. When Virgil caught wind of his plans and once again donned his jacket at cowl. Static joined forces with the Heroes group and high-tech hero Hardware, and proceeded to not only rescue the captured Bang Babies but also orchestrated John Tower’s defeat. When the adventure had concluded, Virgil hung up his costume once more. But he stated that if he was ever needed again that he would return to action. 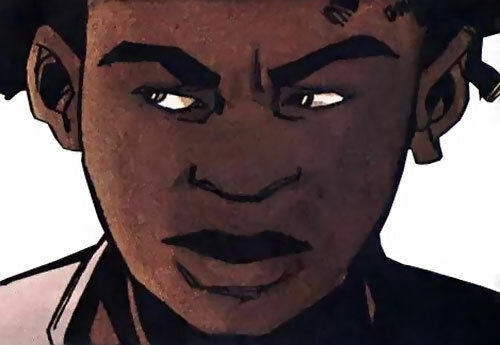 Virgil is a skinny Black kid, with deep brown skin and pronounced African American features. He wears his long curly hair in a long, unruly and unkempt afro. Under normal circumstances, he wears a simple ensemble made up of blue jeans, a t-shirt, a pair of runners and a yellowy orange jacket. As Static, Virgil wears a dark blue spandex bodysuit that covers him head to toe. The suits chest is broken up by a forked bolt of lightning that runs from his waist, over his shoulder and down his back. The suit’s cowl is a simple number. It leaves the lower half of his face exposed as well as his eyes. The eye holes are nothing spectacular, and do nothing to hide the colour or shape of his eyes. Virgil often augments his costume with a few accessories. He normally wears a pair of yellow wrist bands, one around each wrist. He often wears a long flowing yellow hooded jacket as well. Depending on his mood, he can often be found wearing a baseball cap as well, with a variety of logos on it. 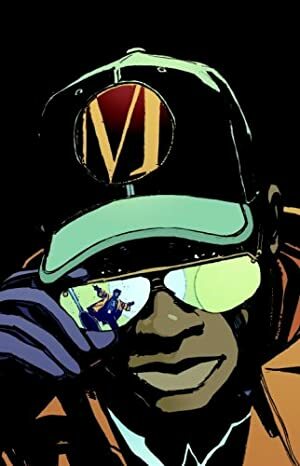 On the outside, Virgil appears to be a relatively typical example of a teenager that grew up in the nineties. He can be loud, sarcastic, falsely confident and in many ways annoying. But once you get past his exterior appearance and antics, it is easy to see that he is an awkward (and somewhat geeky) youth that deeply cares for the people who surround him. He truly has the best intentions at heart. Virgil was always the class clown and a bit of a geek in middle school. His antics and humour were his only coping mechanism that kept the bullies off of him. They also gave him an “in” with the popular kids. Despite this, Virgil is a bit of a ham. He will take any chance he can to through a sarcastic barb at his opponents and batter their self-confidence as well as their body. 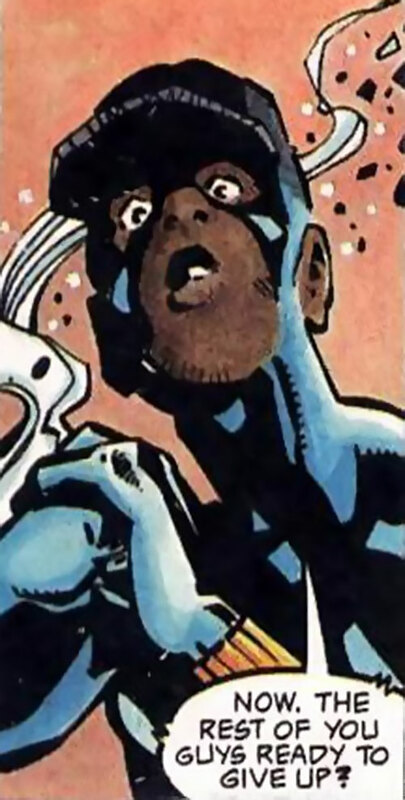 With this in mind, all of the events of Icon actually occurred in the DC Universe, and Static could be encountered by the player characters through the clever application of the Dimensional Travel power. All Powers: Contingent on Electrical Control (-1FC each). Energy Absorption: Usable against Electricity (-2FC), Absorbed energy adds to Power Reserve (+3FC). Power Reserve: Augments Electric Being, Electric Control, Force Field, Lightning, Magnetic Control (+15BC), Must be fueled by Energy Absorption (-5FC & BC:75). Gift of Gab, Schtick (Taunting). Icon (Low), Rocket I (Low). Trash Can Lid [BODY 02. Static stands on this and uses it to fly around with his Magnetic Control, at a rate of up to 7 APs (his magnetic control minus his weight)]]. 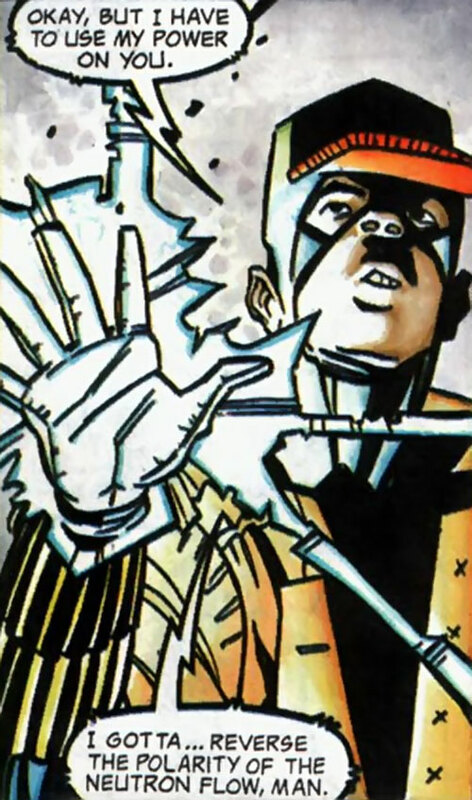 Source of Character: Milestone Comics series – Static, created by Dwayne McDuffie, Robert Washington (co-writers) and John Paul Leon (illustrator). Helper(s): Kynn Bartlett’s Static (Cartoon Version) Writeup. Writeup completed on the 20th of November, 2012.